Like every other six-years-old kid of her age, Gertude always wanted to visit the amazing world of Fairyland and by luck, her wish gets fulfilled as she was sent there. But her entry to the land was rather painful than the happy and cheerful way that she expected all along as she landed on her face when she entered there. Queen Cloudia of the land then greets her to the kingdom and because of having such a near-death experience, a heavily bashed Gertude immediately requests her to send her back from where she came. But now that she has entered the Fairyland, she is a guest here and she can only go back if she can find the key to the door leads to home. A day worth of journey ahead of her, Gertude is then aided by a talking fly named Larry and a map for her quest. However, the search for that special key took her 27 years in Fairyland and she became a violently hateful psychopath who developed a short temper. She was just expressing her frustration over the fact that they just passed something on the map and then instantly gets irritated at the Moon who was narrating the tale. Their conversation gets heated up and she blew up the moon with a cannon and the stars also met the same fate as the witnesses of the occurrence. The dead stars start falling over and Gertude’s increasing madness made Queen Cloudia worried because she is a guest here and cannot be killed. 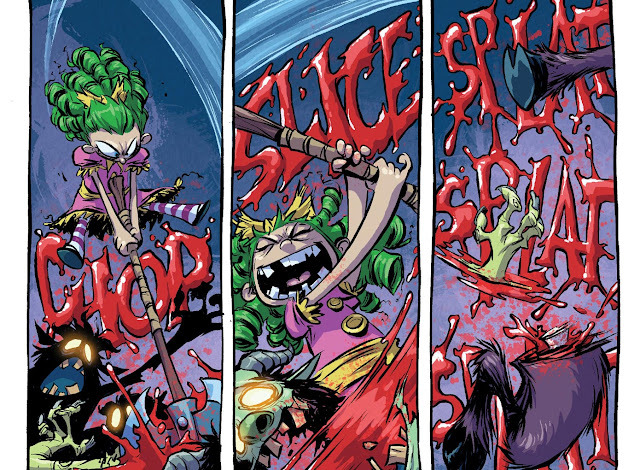 She goes on a rampage by eating the Mushroom Polices, visited Ice Cream Island, beheaded a Hunter and fighting a herd of Zombies while Cloudia plans to teach her a lesson for life. Here is your links for “I Hate Fairyland – Madly Ever After" storyline from Image Comics in issues. 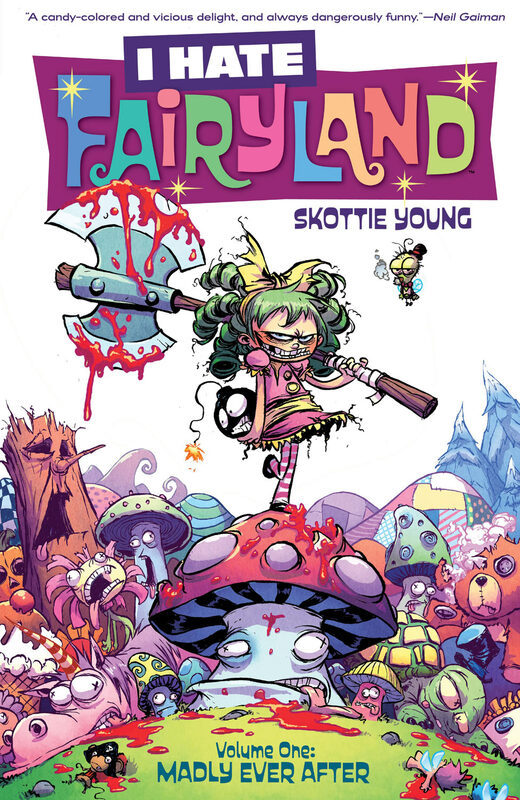 Here is your links for “I Hate Fairyland – Madly Ever After" storyline from Image Comics. “Madly Ever After” is the first chronological volume of the black comedy fantasy comic-book series titled, “I Hate Fairyland” by artist Skottie Young (New X-Men, Venom) from Image Comics, that came out in 2015. The story follows a six-year old girls’ journey into the never-ending Fairyland that drove her insane and clash with the established order. The book collects the first five issues of the hit-series with Young’s complementary visualization of the tale and mind-blowing color rendition by Nate Piekos. Michonne has returned to Alexandria after long and Carl goes after the Whisperers looking for Lydia, leaving Hilltop behind. When Jesus went looking for two of their missing patrolman, he encountered and then captured a member of the Whisperers, who wear walker skin as a camouflage. His captive turns out to be 16-year-old girl named Lydia and is kept in holding cells only for her people to show up with their leader Alpha, to retrieve her daughter. Though she goes back with her group willingly, Carl was rebellious of letting her go because of the ways her people treat her and even argues with Maggie for not giving her up to Whisperers but she chose to trade for her unharmed Hilltop members Ken and Dante. So, he decides to start following them on his own outside of their walls. Sophia informs Maggie that Carl is not in his room and after conversing with Jesus, she came to a conclusion that the boy went after Lydia, which actually worries her thinking they might assume Carl as a spy sent after them. Alpha finds him resting under a tree and after exchanging some banter with each other, she takes him along with her group. Ezekiel and a few of his men from the Kingdom were killing some zombies on their way of heading towards the coast. Rick Grimes and his group came across him to see a fishboat arrive, bringing Michonne. She apologizes for leaving without telling anyone talks to Rick for some time about her past life, abandoning her children for work. Rick is a bit mad at her for the way she disappeared, because he could've loose people looking for her but she explains that despite she being happy with Ezekiel in his Kingdom, there was a calling she needed attending to. He informs her that there would be a fair they are arranging and states Carl would like to see her now that she is back. Back at Hilltop, Gregory is imprisoned for attempting to kill Maggie by poisoning her to take her position in leadership. Though he appeals and begs to people saying he was framed, no one believes him. Maggie interviews bullies' parents to confirm whether or not they knew about Gregory plan to take her life and learns they were aware. In Alexandria, Negan is taking a bath in a tub as two men holds their gun pointed at him and Olivia trims his hair. Andrea came to make sure if everything is going fine and keeps him locked behind his cells again. Moments later, he discovered that the cell door was actually left open contrary to what Olivia believed before leaving. Back from his trip to coast, Rick meets Dwight at the gates that came here to talk about stepping down from the leadership of the Saviors and the former advised that they have an election. Andrea greets Rick inside and he goes to see the cell to find out Negan lying on his back, sarcastically joking at him with the door open. Seeing Rick trying to reach for his gun, the maniac taunts him that he could have sneak attacked or booby-trapped their safe-zone but he didn't do any of that, because he want Rick to trust him a little. Negan then taunts him saying that he is only kept here to remind himself that Rick is better than him by showing him mercy. On Hilltop Colony, Gregory is hanged for attempting murder of Maggie before she heads to Alexandria to attend the fair. Learning about Carl's disappearance, Rick decides to immediately go look for him, accompanied by Andrea, Dante and Michonne. Elsewhere, Carl continues his journey with Lydia and the Whisperers to a place where a large group of their people was staying. Alpha reminds him that he is a captive here and brought here to carry out a message to his people about who these people are. To learn more about the communities and know more of their ways, she then infiltrates the fair. Meanwhile, Rick and his gang enter Whisperers' territory but quickly surrounded by a group of them who took him to his son. An already stressed out session between father-son duo is interrupted when Alpha joins the conversation. For more information on The Walking Dead – Life And Death storyline, you can check out the link below. 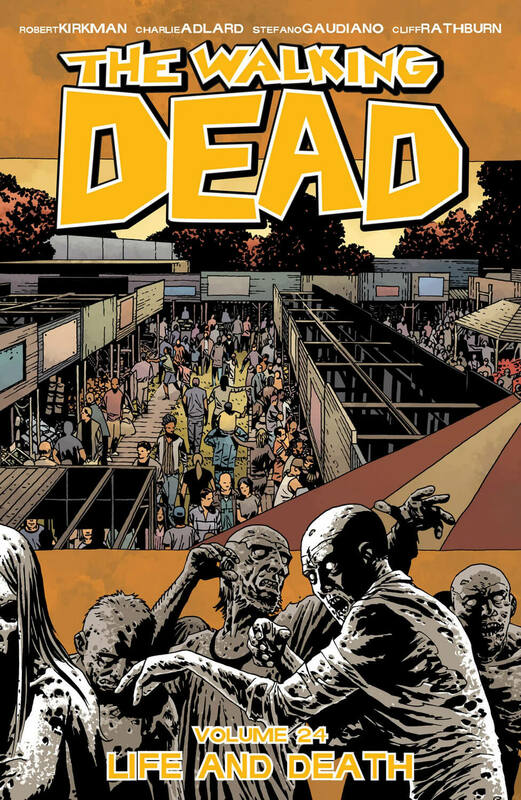 Here is your links to buy "The Walking Dead – Life And Death" from Image Comics in issues on Amazon. 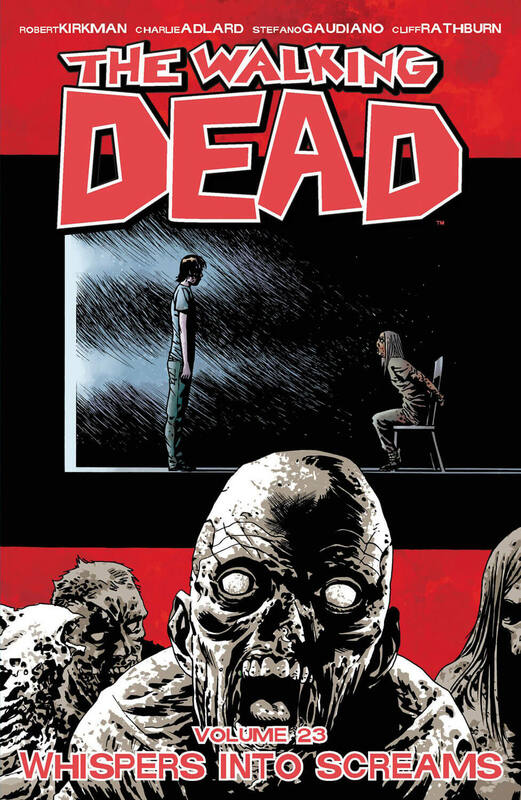 Here is your link to buy "The Walking Dead – Life And Death" from Image Comics on Amazon. Returning once again to collaborate on The Walking Dead monthly ongoing series from Image Comics, writer/creator Robert Kirkman (Outcast, The Astounding Wolf-Man) and artist Charlie Adlard (Judge Dredd, The X-Files) continues their post-apocalyptic journey in "Life And Death" storyline that collects issues #139-144 of the series in 2015. One of the most popular characters from the series, Michonne returns after she went rogue following "All Out War". Her departure throughout "A New Beginning" and "Whispers Into Screams" arc was chronicled into 2016 episodic survival horror graphic adventure game The Walking Dead: Michonne by developer/publisher Telltale Games. The Walking Dead TV series on AMC channel has adapted various plot elements from the story into Season 9. 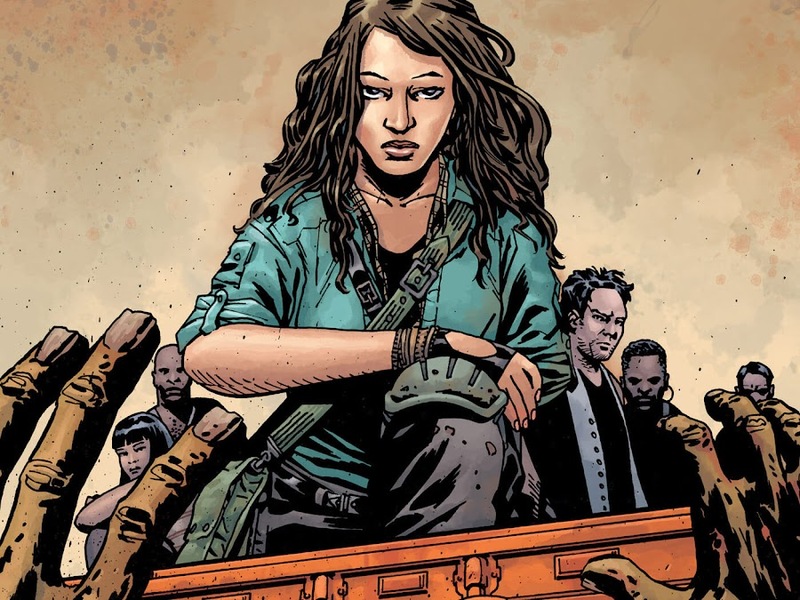 Unlike the show, few important characters are still alive and kicking as Kirkman is developing their roles to fit more properly. Negan seem to have been going towards a change from who he was all along, holding so much promise for a better future. 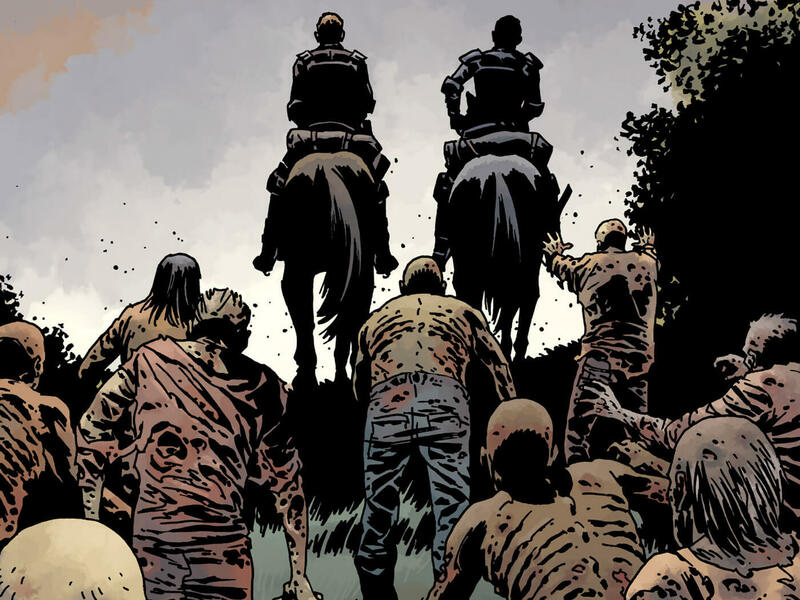 Rick Grimes and his survivor group of Alexandria has unfortunately come across one of the most ruthless group that would probably force their hand into a war against Whisperers and tensions are already building towards that conflict between leader of two groups, which will be explored further in upcoming "No Turning Back" story arc. The new era of peace that Rick and his fellow survivors established in a post-"All Out War" period is now threatened with a new type of enemy. Previously, a survivor named Magna and her group has been rescued from a massive horde by Paul Monroe and brought to Alexandria Safe-Zone. After their initial interview session with Rick Grimes, they decided to stay but her friends remain skeptical that the town is surely hiding something and sneaked into the basement to find an imprisoned Negan. Though he claimed to have been tortured and wanted their help to get out of his cell, Magna brushes off his claims immediately saying he is lying and then they leave. The group then confronts Andrea about the events before their arrival and she fills them in on her relationship and stand with the community until All Out War era. Carl has moved to Hilltop to become a blacksmith under the tutelage of Earl Sutton and despite being unwilling at first, Rick eventually agrees to his wishes. There, he reunites with Sophia and was slowly trying to settle down away from home until they got in trouble with two boys. Carl has almost beaten them to death for attacking his friend viciously. Earlier, Ken and Marco went to an uncharted territory way past Hilltop Colony chasing a pack of wild horses but they faced a horde and were forced to flee. The latter made it back to Hilltop but Maggie Greene is skeptical about his story of whispering Walkers. Nevertheless, she sends a small search party of Dante and two other men to go find Ken. As they arrive near a countryside barn, a herd arrives out of nowhere and they fight back. When only few of them remained, one of them attacked with a knife, which scared Doug and two of them died except Dante. He discovered his slain victim is a human female under Walker skin and another disguised survivor holding a shotgun to his head. Jesus goes to investigate a patrolman gone missing and a herd of whispering Walkers quietly followed his group. When they are about to go back, the living zombies ambushed on them that led to the death of all but Darius and Paul. Jesus managed to kill all of the Whisperers before taking one of them prisoner and his wounded friend back at Hilltop. Jesus starts interrogating the Whisperer who is a 16-year-old girl named Lydia and learns more about her group who wear skins to roam among the Walkers. Though Sophia is treated, Maggie had to lock Carl up due to the serious outrage from fellow citizens. These two talk to each other about what is going on from their cells and slowly bond. The bullies' parents furiously argue over the fact that their kids almost died yet Carl is running around free. Gregory suggests that they kill Maggie Greene and has him reinstated as their leader once again but no one really wants to follow this extreme idea. The father of one of the bullies later approaches him about his plan but he wants Carl dead as well. When things get really heated up in the infirmary between the angry parents and Maggie, Gregory steps in to offer peace but tries to intoxicate her with a drink later in his trailer. Only for the timely intervention of Jesus, she was saved. A small group of Whisperers showed up at Hilltop to get back one of their own in exchange for Ken and Dante and their leader introduces herself as Alpha. Although Carl is totally against the idea of giving Lydia back to her people for their savage way of life, Maggie deems it would not be a wise idea to get in conflict with these people. For more information on The Walking Dead – Whispers Into Screams storyline, you can check out the link below. Here is your links to buy "The Walking Dead – Whispers Into Screams" from Image Comics in issues on Amazon. Here is your link to buy "The Walking Dead – Whispers Into Screams" from Image Comics on Amazon. The post-apocalyptic journey of The Walking Dead monthly ongoing series from Image Comics picks a new pace from the previous storyline "A New Beginning" and now heading towards another major arc with "Whispers Into Screams" by writer/creator Robert Kirkman (Image United, Invincible) and artist Charlie Adlard (Judge Dredd, The X-Files). The story starts building a major challenge for Rick and his allied communities to live up to following their hard earned victory against the Saviors and their lunatic leader Negan. However, these are a new breed of enemies that literally run along with the undead march and have a philosophy towards life that is devoid of any emotion or attachment. Similar event of introducing these new enemies from the story is also adapted into the mid-season finale of The Walking Dead TV series Season 9, except for a change of character cast and a major shocking consequence for one of the good guys. Although there hasn't been any major tension building up throughout the entirety of the book except for a few casualties, the upcoming "Life And Death" promises some groundwork for the gathering storm headed towards the survivor communities. Rick Grimes with his fellow group members will rise up to fight their biggest battle against Whisperers. War is over and away from The Walking Dead, Rick Grimes now lives a peaceful life among in Alexandria with friends. A survivor named Magna and her group watches a few Walkers from over a trailer hitched to horses as they were going through the woods. She tells everyone to lie down when it emerged to be a larger horde and when one of them nervously suggests that they should get out of here on the horses, she points out that they will never made it out. Some of the zombies get to a horse and the rest started to push the trailer over to drop everyone on the ground. Magna tells everyone to draw their weapon and make a hole among the crowd. She almost got bit in the arm when one of the roamers caught her but saved at the nick of time by the arrival of Paul Monroe AKA Jesus and his cavalry. He instructs her team to cut the horses loose and get to the tree line nearby while they distract the horde. Magna and her group follow the instruction but one of them was not too fortunate to survive the mob. Eugene Porter, Heath and Rosita Espinosa join Paul in driving the massive herd away to further east by working collectively. Eugene points out that the herd has moved direction approximately 10 miles away from The Kingdom. Though the trouble is averted, some of them are not happy about losing one of them but invited to Alexandria Safe-Zone, the group came along. In Alexandria, war has ended long ago and Rick Grimes lives a peaceful life as a family man with Andrea and his son Carl Grimes. He wears a prosthetic hand, grew a beard and has to walk with a cane these days. The community is rebuilt and has changed a lot too. They have new people living within those walls, got new crops, farms and houses as well. Jesus brought in the survivors to Rick and they decide to stay after a brief introduction. He then heads to the munitions factory and asks Eugene not to go on herd duty anymore. Carl says that he wants to be a blacksmith and work with Earl Sutton of Hilltop Colony. Even though he does not want his boy to leave this place, he eventually agrees to consider it. That night, Carl goes to the basement to talk to someone about class and after hour activities involving a girl he liked. The person in shadows offer him his perspective and when the boy was about to leave, asks if Carl still wants to kill him. 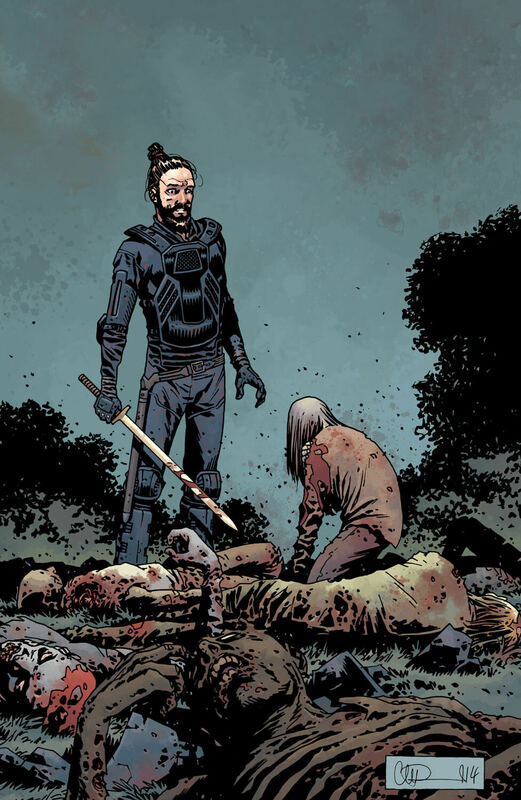 He states his intentions are positive and that figure is revealed to be former leader of the Saviors, Negan. The next day, Andrea is interviewing Magna and her friends on how they survived so long and how many were they. Later at their own place, she and her group talks among themselves about whether or not to trust Rick and his people because what they have here seems too good to be true and she thinks that Alexandria is hiding something. Ken and Marco of the Hilltop Colony see a pack of horses on uncharted territory and even though the latter urges to go back, the former insists to bring them to Hilltop. A few zombies arriving out of nowhere caused him to fall from his horse and stuck underneath it. Marco carries Ken onto his horse after seeing a few more approaching. They go a long way on horseback but then Ken falls off the horse and as his friend came to help, the horse ran off. These two then continue on foot and more Walkers begin to close in. Refusing to leave Ken back, Marco drags him to a nearby ditch and watches the horde leave. To their surprise, the duo hears the roamers whispering among them. For more information on The Walking Dead – A New Beginning storyline, you can check out the link below. 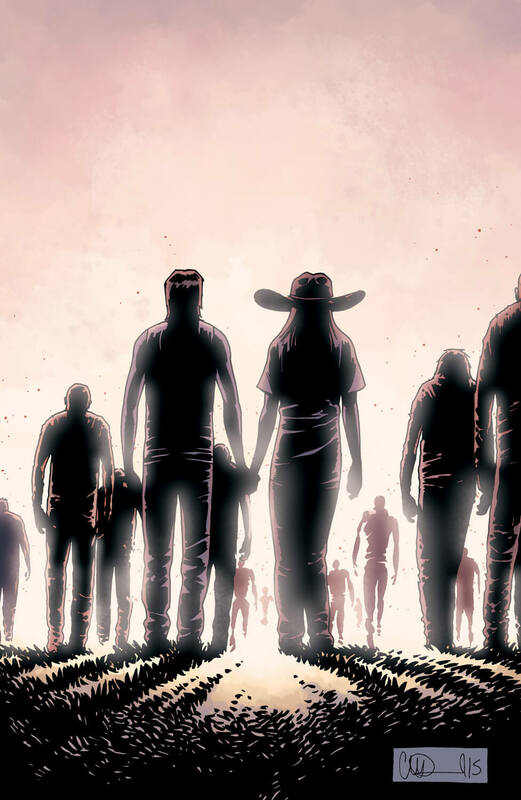 Here is your links to buy "The Walking Dead – A New Beginning" from Image Comics in issues on Amazon. 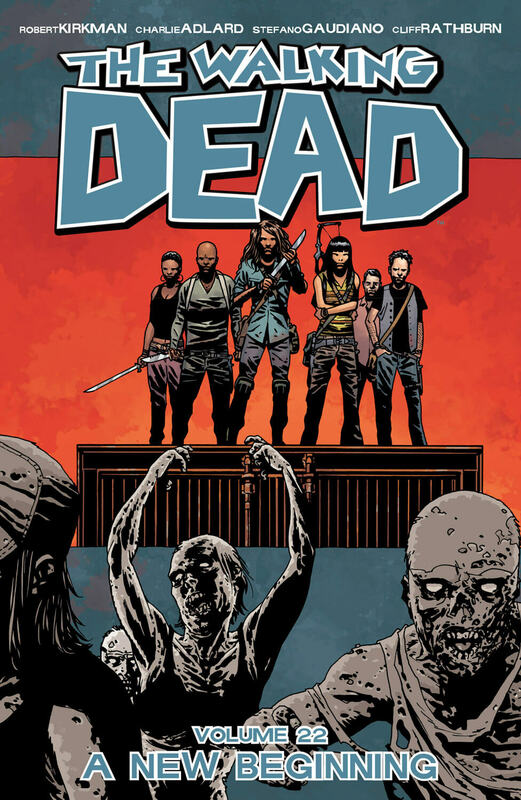 Here is your link to buy "The Walking Dead – A New Beginning" from Image Comics on Amazon. 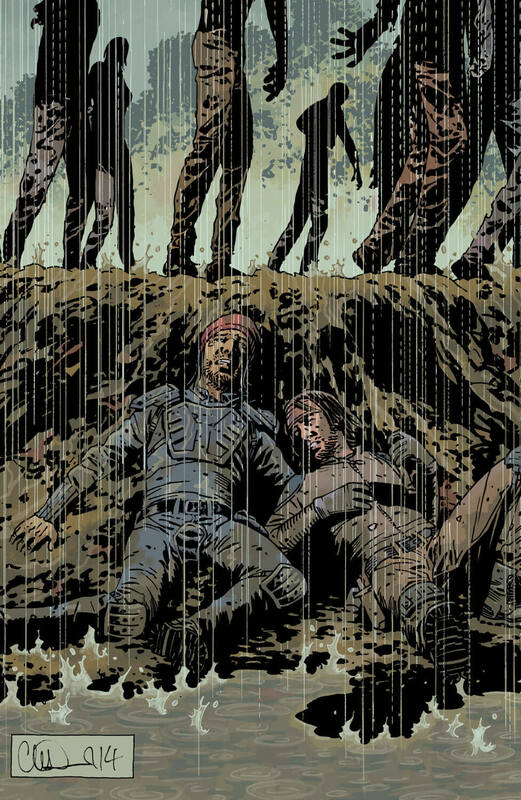 The monthly ongoing series of The Walking Dead from Image Comics has returned with a new status quo, which is set long after the events of "All Out War" in 2014. Series regular writer Robert Kirkman (Battle Pope, Haunt) and artist Charlie Adlard (Judge Dredd, The X-Files) returns to usher "A New Beginning" of the post-apocalyptic world of undeads. Collecting issues #127-132, the story brings in new survivors into the play and catches up to the aftermath of the Great War against the Saviors. Kirkman didn't cease to amaze by developing a larger concern for the survivors that they will be facing in future. The story introduces a new group of enemies called The Whisperers, who are a major threat for Rick Grimes and his fellow survivors at Alexandria Safe-Zone and their leader, Alpha also makes her debut. This very dangerous group of people roams in group and wears Zombie skins as camouflage to blend within large number of hordes. The above-mentioned adversaries make their live-action first appearance on mid-season finale of the Season 9 of The Walking Dead TV series on AMC. The Whisperers will make their presence fully known in the next story arc "Whispers Into Screams". Ever since Glenn died at the hands of Negan, Rick Grimes has been eagerly waiting to teach him a lesson. Last time, when Negan and his Saviors came to Alexandria Safe-Zone for supplies, things got a bit out of hand as Rick and his crew unsuccessfully tried to get the drop on Negan. He in turn, lines them up for execution but is forced to retreat for the timely intervention of Jesus, Ezekiel and Shiva. It is pretty evident that The Saviors will go to war against Alexandria and so, Rick and his allies prepares themselves for the oncoming conflict. However, Rick feels a bit of concerned as he has never done something this big and the last encounter with Saviors almost got Andrea killed. Along with The Kingdom and Hilltop forces at his side, Rick leads the crowd towards The Sanctuary. Rick approaches Negan for a truce, which he declined and revealed Gregory's allegiance with him. But that brings no significant change to the scene and the war between the two parties broke in. The heavy firing draws attention of walkers nearby and they all started to form a herd and heads towards The Sanctuary. Rick was about to ram the fences of Negan's stronghold but Holly ditches him and took one for the team. Sanctuary gets overrunned, Negan gets furious, Holly is captured, Ezekiel loses Shiva and both sides took heavy causalities. After dealing with the undead horde of his compound, Negan heads to Alexandria Safe-Zone for payback resulting major damage. Both of Rick and Negan's side came up with a new and improved plan to triumph over the enemy. For more information on The Walking Dead – All Out War storyline, you can check out the links below. 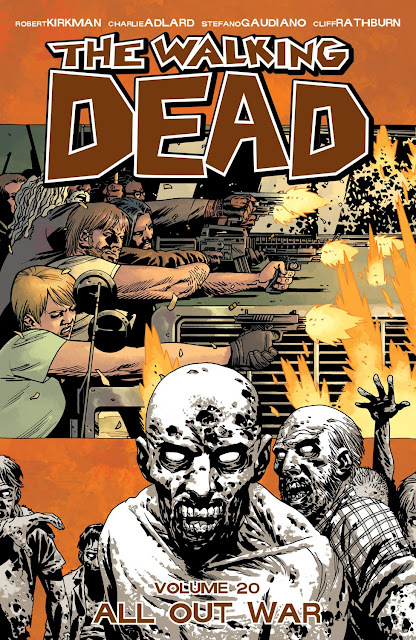 Here is your links to buy “The Walking Dead – All Out War" from Image Comics in issues on Amazon. Here is your links to buy “The Walking Dead – All Out War" from Image Comics on Amazon. Created by writer Robert Kirkman (Outcast, The Astounding Wolf-Man) and artist Charlie Adlard (Judge Dredd, The X-Files), "All Out War" is a major storyline from Image Comics' monthly ongoing series The Walking Dead. 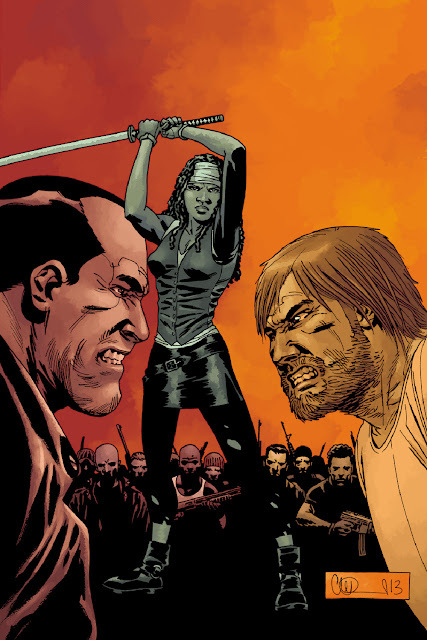 Concluded from 'March To War', this storyline breaks the regular tradition of the stories to be concluded in six issues and expanded to size double that the regular. That means, "All Out War" is comprised of twelve issues, containing issues #115-126 from The Walking Dead comic series. The story-arc is big and has a groundbreaking impact of the post-apocalyptic world that is the brain-child of Kirkman. The book is also adapted for Season 8 of The Walking Dead TV Series on AMC TV. After the dust and cloud of the war gets cleared, "A New Beginning" awaits at the horizon.